In the hometown where, so they say, he still spends many a weekend, Bishop Joseph Martino was always known as an easily approachable, eager presence, downright brilliant in intellect with a wonkish devotion to detail, ever faithful in his words and helpful with his gifts -- all while earning no shortage of fame behind the scenes for a principled, fearless honesty as formidable and blunt as his mind is sharp. And some pretty expansive homilies, to boot. Then again, his doctoral dissertation in church history did devote itself to the episcopate of Patrick John Ryan, the silver-tongued Irishman whose dedication homily of St Patrick's Cathedral in New York went on for some two hours. Though his more spirited candor essentially lay concealed from public view during his days an auxiliary bishop of Philadelphia -- a 1996 elevation more Tiber than Delaware in its making -- the quality has taken center stage since Martino, now 62, was sent up the Blue Route in 2003 to lead the 350,000-member church in Scranton, one of American Catholicism's strongest ethnic bastions, where the Jesuit-trained prelate's unstinting fidelity and fervor have earned him both strong praise around the country and heated dispute at home. The bishop's threat was almost incomprehensible. In this heavily Roman Catholic city, where tens of thousands of people pack downtown for the annual St. Patrick's parade, Mass would be canceled that day if organizers honored an abortion-rights supporter. 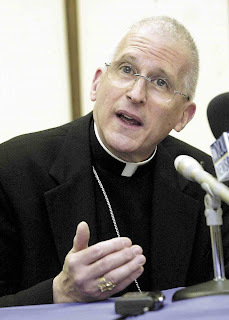 The warning — seen by some as a reference to Vice President Joe Biden, a native son — was the latest in a series of tough stands by Bishop Joseph Martino, who is establishing himself as one of the nation's most outspoken defenders of Catholic orthodoxy. The showdown over Saturday's pre-parade Mass at St. Peter's Cathedral started with a letter to organizers last month. In it, Martino said he would temporarily close the church if the event "should honor pro-abortion officials and the Catholic Church is seen to be involved in this honoring." The honorees, who include Biden's sister and mother, apparently passed muster, because Martino decreed last week that Mass would be held as usual. But the controversy surrounding Martino himself is far from over, as evidenced by the vigorous debates on local editorial pages and talk radio. The bishop declined to be interviewed by The Associated Press. Martino, a 62-year-old Philadelphia native, came to Scranton in 2003 to replace retiring Bishop James Timlin in overseeing a diocese that serves about 350,000 parishioners in northeastern Pennsylvania. Since then, he has directed priests to deny Holy Communion to public officials who support abortion rights. He interrupted a parish forum on last fall's election to say opposition to abortion was by far the most important issue to consider when voting. Martino also blasted the Diversity Institute at Misericordia University, founded by the Sisters of Mercy, for sponsoring lectures by a gay-rights advocate last month. Calling the speaker's beliefs "disturbingly opposed to Catholic moral teaching," Martino demanded the school disband the institute and disclose the names and content of classes that purport to teach Catholic sexual morality. "It is not only my right, but my obligation to ensure that authentic Catholic teaching is being provided in all Catholic institutions in this Diocese, and that viewpoints in opposition to this teaching are not being presented as acceptable alternatives," Martino wrote in a statement. Misericordia said it is committed to both its Catholic mission and its academic mission of exploring ideas freely. School officials are trying to meet with the bishop to resolve the issue, said university spokesman Jim Roberts. Martino has also released letters harshly critical of U.S. Sen. Bob Casey, a parishioner and longtime foe of abortion rights. In them, he chastises the Democratic lawmaker for opposing family-planning legislation the church backed. His supporters insist Martino is simply enforcing church teachings. "He believes that people who call themselves Christians or Catholics have a moral obligation to live their faith. All he is asking them to do is to practice what they preach," said Gary Cangemi, 54, of Scranton, the vice chairman of the local chapter of the anti-abortion group Pennsylvanians for Human Life. "He is setting a great example." Yet critics claim Martino, unlike his predecessor, is hardly pastoral and rarely seen. Michael Milz, president of the local teachers' union for parochial schools, accuses Martino of ignoring Catholic social teaching on workers' rights. The bishop has refused to recognize the union. Upon learning that union members planned to march in Saturday's parade, Martino again threatened to cancel Mass. "He doesn't speak to anyone. He issues press releases," said Milz. "He has a 15th-century mentality." Milz said he never expected such an antagonistic relationship with Martino. Catholic teachers in the Philadelphia area, where Martino once taught, spoke warmly of him, Milz said. "He was very friendly, easygoing, great sense of humor — a very nice man," said David McQuiston, who worked with Martino at Bishop Shanahan High School. "The bishop that we see described in the newspapers doesn't seem to be the person we had taught with." Saturday's Mass will go on as scheduled. Biden was not chosen as an honoree, but the Society of Irish Women — one of three groups organizing the parade — is honoring his sister and mother at a dinner Tuesday. Last weekend, Martino went on camera for the first time in months to vouch for his outspokenness. "I speak so forcefully about the right to life -- the sanctity of life -- from its beginning at conception to natural death, [so] that we not make ourselves God, the way Nazi Germany did," the bishop told a local TV station. For the record, while his surname's Italian thanks to his late father, Martino is half-Irish. Long Knives in the Palace? "A Discussion of Such Vehemence"